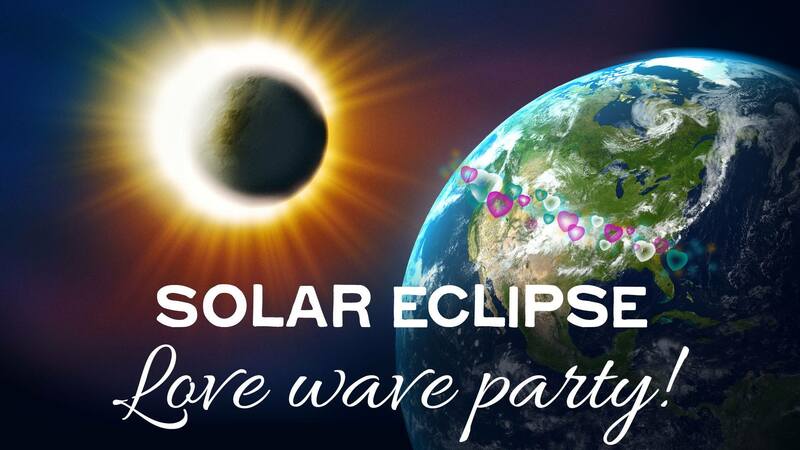 My Mentee, Andrea Bauer, and I would like to invite you to join us in a virtual Solar Eclipse Love Wave Party! What it is: We’ll be combining the energies of our hearts (Andrea will show you how via meditation) with that of the total solar eclipse (very powerful energy) for the purpose of spreading big continuous waves of love and compassion out across the United States, Spain, British Columbia’s forests and all places in the world suffering from both natural and human-made mass disasters. . .
We will join together and send positive waves of love and healing energies around the world on 8/21/17 from 9am – 1pm PDT. There’s a lot of science behind the effective impact of this which I won’t go into here. Suffice it to say – IT WORKS! – invite your friends, family, kids, colleagues, neighbors….the more love the better! There is no place for hate in this world. Let’s fill our hearts and the world with love.